A pioneer in both new media and internet outreach, Ali can run down the list of reasons people around the world are coming to this region and he is proud of what his nation has accomplished. At the same time he sees the risks and responsibilities that come with success and wealth, as he talks about the things that concern him in the near future. 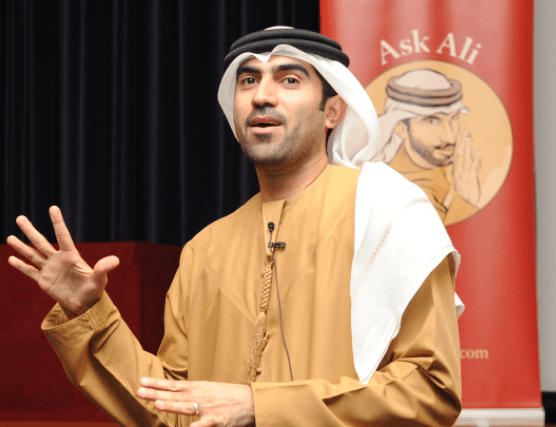 While much of my journey has been about taxi drivers and the wisdom they can share about this place and life as a whole, a conversation with Ali Al Saloom provides a rare chance to hear from a citizen of this nation and to learn from his unique experience. Thank you young lady. Indeed it was fun to get over to Abu Dhabi and get to hear his personal experience. You may want to consider asking for comments at the end of each episode. Better still, you could ask a specific question for listeners to respond to. Your Dubai recordings are wonderful. But I think your reflections after the trip will be something else entirely, so far beyond your usual interviews. It’s clear that your time in UAE has given you a different way of looking at things, an completely new perspective that will affect how you view the world. Keep doing what you keep doing, it’s immensely valuable.